Quicken Online is improving. 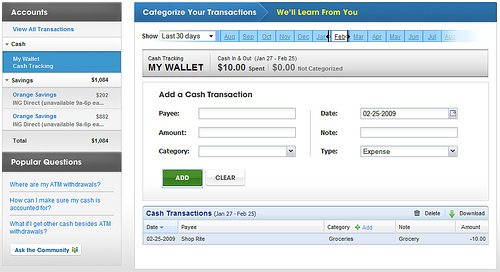 The online money management site just added a new feature to make tracking and managing your cash transactions easier. The new feature is called My Wallet. With My Wallet, you can manually enter cash transactions in Quicken by providing such information as Payee, Transaction Amount, and Category, as you can see from the following screenshot. And if you are using iPhone, you can enter your transaction right from your phone so you won’t forget about it later. Once a transaction is entered, it will be included in the monthly spending report, which you can view online under the Trend tab. 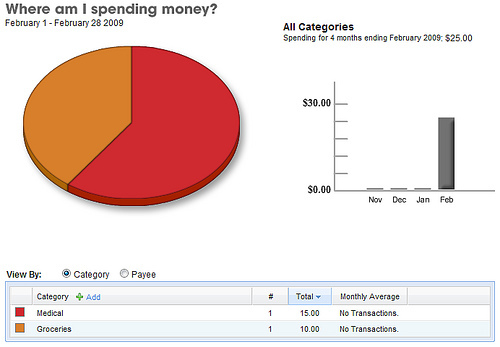 The Trend analysis tool gives you detailed report on how you spent your money. You can either view your transactions by categories or group them by payees. With these information, you can easily make your budget based on your past spending and identify where you can cut back and save money. Good idea. I would have trouble keeping track of all my cash transactions. When I pay with cash I don’t want to write it down (or don’t have the discipline).